This fortnight’s report begins with a list. The list is called “Five things that have surprised me, Carson Cistulli, about living in Portland, Ore..” It concerns some things that’ve surprised me about Portland since I moved here two years ago. The relevance of the list will be revealed at its end. The list begins right now. 1. There are basically zero Italians and Jews in Portland. I’m not Italian-Italian, but I’m Italian enough. I mean, I got the last name, I got a bisnonno from the patria, I got a speaking voice that’s inappropriate for indoors. Like I say, Italian enough. From my experience, Italians and Jews share a lot. Like the ability to raise guilt to an art form, for one thing. And excellent delis. And louder-than-necessary talking voices*. *Funny because it’s racist, or funny because it’s true? You be the judge! Well it turns out that neither group really made the trip out here—not to Portland, anyway. The absence of the the delis is a real blow. At Serio’s Market in Northampton, Mass. you can get a giant corned beef sandwich for $4.50. That same sandwich, with some artisanal flourishes, is about eight dollars at Bunk in Portland. Sure, it tastes good, but come on: How much money you think I got?! 2. Everyone in the city of Portland is under 23. Okay, not actually 23. Maybe more like 25. Regardless, it’s crazy how young the populace is. It’s just sad, is what it is: babies having babies having babies. I don’t know exactly what that means, but I’m sure there’s at least a kernel of truth in there. On second thought, maybe it’s not so much that Portland is actually young but just that it looks young. Part of the reason is probably that the only place to buy new clothes within city limits is American Apparel. I’m serious: Go to the website for American Apparel and you’ll find that there are 137 locations in Portland. Do it now before it’s too late. The other reason people look so young is the tatts. Which, that’s number three. 3. Everyone in Portland has a tattoo. I want you to think for a second and ask yourself this question: “Would Carson Cistulli lie to me?” Because if the answer is yes—yes, Carson Cistulli would look you in the face and lie to you—then this just isn’t going to work out. But if you think I’m the sort of guy who’s gonna shoot straight, who’s gonna tell it like it is, then believe me when I tell you: EVERYONE IN PORTLAND HAS A TATTOO. Some of the tattoos are just designs. Some of them are of Mother Gaia weeping gently on account of what’s happening to the forests. One girl I saw on the street had a one-to-one scale tattoo of Greg Oden all over her body. Lucky for her, she’s seven feet tall. 4. Coffee can get really good. I’m not what you’d call a gourmand. I’m barely even what you’d call “a person who knows how to use a fork.” Still, I recognize that the coffee here is excellent. I don’t know what they do to it or how. I do know that if you ask, they’ll tell you for like 10 hours. 5. I met (and occasionally talk to) World Famous Baseball Writer Rob Neyer. I think maybe there are aspiring young actors who move to Los Angeles with the idea that they’ll meet, like, Quentin Tarantino or Jerry Bruckheimer. Just like, there are probably young politicos who move to Washington, D.C. in the hopes that they’ll get all buddy-buddy with Orrin Hatch or whatever. I think it’s probably not healthy to go about your life like that. Which is why, when I moved to Portland, I never said, “I’m going to Portland so’s to meet World Famous Baseball Writer Rob Neyer.” Sure, I secretly thought about it, and maybe, yes, I wrote about it (at length) in my diary, but I certainly never said anything about it aloud. That would appear desperate. Well wouldn’t you know it, after all that, I went and met Rob Neyer anyway. I won’t tell you the whole story, but I can tell you for sure that (a) it involved a planned encounter atop New York’s Empire State Building and (b) we have a handshake so secret that even Neyer himself doesn’t know it. The reason Rob Neyer is relevant to this report is on account of I WATCHED THE FLIPPING GAME AT HIS HOUSE! I know: pretty amazing, right? Well, listen, I assumed that the Hardball Times reader would have some questions about Neyer and his house and everything, so I took the liberty of putting together what I considered a completely realistic, if totally fabricated dialogue between you and me. You’re the one in bold. Go. First off, why come you were at Rob Neyer’s house to begin with? Shut up. You were house-sitting for Rob Neyer? Yeah. Well, remember how Neyer was tweeting from that one Giants game? He was in San Francisco. I wasn’t. I was on his couch. First of all, that’s not a question. Second of all, you should believe me; it’s true. Okay. If you were house-sitting for Rob Neyer, what’s his address, then? I’m pretty sure I shouldn’t just be giving that out over the internet. You’re right. How bout his phone number? Okay. An actual question: What’s Rob Neyer’s house like? Have you ever been to Hearst Castle? It’s sorta like that, except smaller and, instead of great works by the European masters, it has Starting Lineup-brand baseballing figurines. Does he have all the Bill James Abstracts? Yeah, and not just that, but he also owns a number of the prequels to the Abstracts. Nobody really knows about this, but James wrote them at the same time as the originals with the intention of releasing them afterward. Oh, I know: How many flannel shirts does have? I don’t know if a googleplex is a real number, but if it is, then that’s how many. Last question: What’s his address? This is a report on a game that took place Sunday, Sept. 19, between the Florida Marlins and Cincinnati Reds. Ricky Nolasco pitched against Bronson Arroyo. As I mention in a recent post over at RotoSynthesis, there’s a lot of new talent working its way into the lineup over in Cincy. Drew Stubbs, Juan Francisco, Drew Sutton, Adam Rosales—all have gotten some PAs to work with. Furthermore, Wladimir Balentien has decided to approach his minor league numbers, posting an almost-respectable PrOPS of .262/.355/.391. Also, I hadn’t seen Ricky Nolasco pitch since his brief sojourn in the minors. Since said demotion, Nolasco has posted a K/BB of 142/29 in 133.2 innings and held batters to a line of .233/.274/.383. Nick Johnson 		1B	.317/.504/.468	Dork heartthrob. PrOPS GPA of .344 w/Florida! Hanley Ramirez 		SS 	.289/.361/.489  PrOPS are surprisingly pedestrian. Drew Stubbs 		CF	.258/.304/.488  Over 50 SB between MLB and MiLB! Laynce Nix 		LF	.265/.312/.470  Lineup optimization much? Career .295 wOBA. Juan Francisco 		3B 	.251/.277/.432	MLE between Double- and Triple-A. Either Drew Sutton or Adam Rosales would’ve started at shortstop. They’re both more interesting than Janish. I mean, Janish is fine, but his upside is limited. Were either Rosales or Sutton able to stick at short, they’d bring a lot of offensive value for the position. Cameron Maybin would play up to his crazy potential. 1	0	Strikes out swinging on a change-up in the dirt. 8	1	Grounds into double play on first pitch. Ends inning. Total WPA for the day: -.222. Francisco struck out three times on three different pitches: a high and outside fastball in the first, a low curveball in the fourth, and a low and outside change-up in the seventh. Then he got lifted for pinch hitter Jonny Gomes in the ninth. Of course, the night before, he did this thing. Nolasco struck out 10 of the 26 batters he faced over seven innings. He did allow two home runs and he did induce only one ground ball. Still, he was incredibly entertaining, mixing in a combination of three breaking pitches: a slider, a loopier curveball and then a tighter curveball. 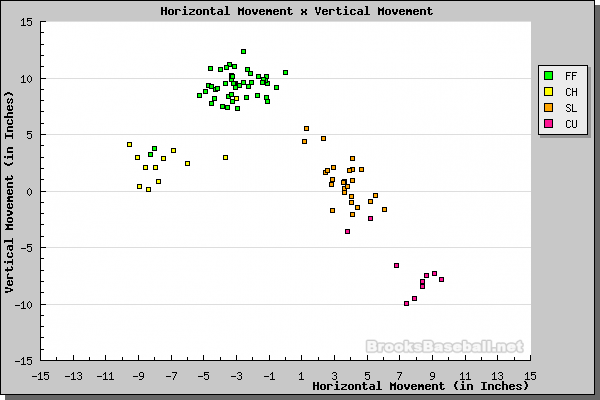 His PITCHf/x chart below (courtesy of Brooks Baseball) demonstrates as much, showing those couple of curveballs that more resemble sliders in terms of break, sans about eight mph. I’m not admitting to anything without my crack team of lawyers present, but there’s a chance—a CHANCE—that I flipped over to the Philadelphia/Atlanta game a couple times, on account of Pedro Martinez and Javier Vazquez were pitching. Do you wanna know something? Javier Vazquez’s curvepiece makes me a Better Man. Sometimes, after I’ve seen it (i.e. his curvepiece), I’ll just go outside and help an old person cross the street. I’ll just go walk some dogs at the SPCA or something. Frig, I’ll check the box on my 1040 Form that asks if I want to donate a dollar to the Presidential Election Campaign Fund. Translation: I get hella magnanimous. I’m not sure these sorts of numbers appeal to the reader, but I haven’t tried this before, so I thought I would. Anyway, what they bear out is something I’ve been saying since I was born: Drew Stubbs is awesome. They bear out something else that I’ve never, ever said, too—namely, that Ross Gload is sometimes worth half a win to his team.